A growing interest in local and regional food offers lucrative opportunities for beginning farmers, and growing farm products for these markets often require a less significant investment in land and equipment than other production methods would. However, direct-to-consumer sales do require that farmers spend a lot of time and effort on marketing. Even folks who enjoy selling at their local farmers market may see cash flows evaporate if customers stay home in bad weather or if markets only operate seasonally. Diversifying marketing outlets can help with both problems. How can farmers interested in replacing or augmenting direct-to-consumer sales move product? Another route to accessing local markets is selling to local institutions, including schools. 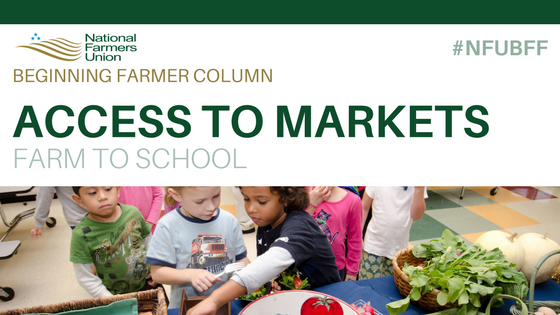 Schools are linked with and accountable to the communities they serve; there are any number of ways the civic-minded farmer could connect with school leadership to gauge and invoke interest in local food. But serving schools can be tricky – they have substantial nutrition and food safety standards and reliable volume requirements that may be difficult for a single producer to fulfill. But these stipulations could encourage different farmers in an area to work together and to collaborate closely with schools in their area. Where partnership with schools can be established, The U.S. Department of Agriculture has a competitive grant program that can help make the connection. The applications for the 2018 grant awards are due December 8, but even if you don’t plan to apply this year, it is not too soon to begin planning for the next. Grants are awarded for either planning or implementing activities. USDA has funded only a fraction of the applications received, indicating that grant support is highly competitive – but also perhaps that the desire for local food in schools is growing. Information on past grant awards can be assessed here for inspiration on projects that might be possible for your farm and in your community. Are there any Farm to School projects in your area? Would you be interested in marketing your farm products to school food service, or in seeing local foods in your child’s school lunch? Please share your thoughts in the comments below.